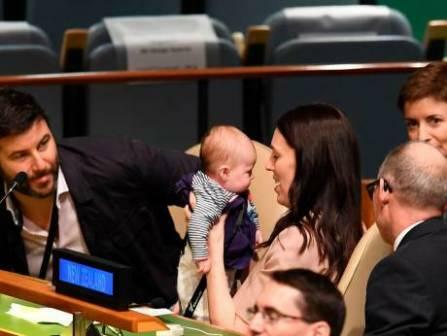 In UN General Assembly Hall, the PM of New Zealand brings her three-month daughter Neve, she has seen kissing her daughter in Hall. New Zealand Prime Minister, who reports to international renown by the giving birth in office while job time, heads twisted by Monday when she bringing her three-month daughter in UN Assembly Hall. Jacinda Ardern, who is 38 years old and the second world leader who ever give birth while in the office. The first was the late Benazir Bhutto, who was the Prime Minister of Pakistan when her daughter was born in 1990. The best photographed was kissing and bouncing up and down daughter in UN Assembly Hall next to companion Clarke Gayford, at the complete meeting known as the Nelson Mandela peace summit, which she also addressed. Gayford, who is a host of television angling show and who plans to be the main caregiver for their daughter, that classified her as “New Zealand first baby”. He wrote “I wish I could have captured the startled look on a Japanese delegation inside UN yesterday who walked into a meeting room in the middle of a nappy change. Great yarn for her 21st,”. Ardern became prime minister in October just three months after taking charge of the Labor Party as it suffered in the elections. She returned to work last month after a six-week maternity leave. She had already proclaimed that they would travel as a family to the United Nations in New York, where she will address the General Assembly. Earlier on Monday, she spoke at the presentation of the annual “Climate Week” occasion. Pregnancy, motherhood and her alliance government have twisted her into a print child for women's movement against the setting of the #MeToo movement in the United States, where she is taking part in a sequence of media arrivals. “It felt at the time on par I have to say!” she joked on The Today Show, the leading morning program on NBC News when asked what was stiffer — taking a three-month-old on a 17-hour flight or running the country.